XMM-Newton has detected periodic X-ray emission, or the pulsed heartbeat of a new type of star. Collecting the X-rays from the so-called rotating radio transient has confirmed the nature of the underlying celestial object and given astronomers a new insight into these exotic objects. The observations were made using XMM-Newton's European Photon Imaging Camera (EPIC), which targeted the celestial object RRAT J1819-1458. Astronomers observed the object for around 12 hours and detected pulsations in the X-ray data that show the source to be rotating once every 4.26 seconds. Previously, astronomers had only seen radio outbursts from this object. It erupts every three minutes or so with a brief burst of radio emission lasting just 3 milliseconds. Such behaviour defines the object as a rotating radio transient. The RRATs were announced in February 2006. Eleven objects were found using the Parkes radio telescope. Astronomers suspected that RRATs were neutron stars, the compact remnants of dead stars made of neutrons and measuring just 10-12 km across yet containing more matter than the Sun. They are therefore extremely dense. Most observed neutron stars are radio pulsars; rotating quickly and sweeping lighthouse beams of radiation across space that make them appear to pulsate. The RRATs, however, were only detected through their radio bursts. The new XMM-Newton observations show that periodic emission, linked to the object's rotation, can be detected in X-rays. "It is now definite that RRATs are rotating neutron stars as we can see the 4.26-second rotation period of the RRAT in the X-ray data," says Maura McLaughlin, West Virginia University, USA, who took the lead in the research. In addition to the identification of the underlying celestial object from the discovery of the X-ray pulsations, XMM-Newton also revealed another facet of the RRAT's behaviour. Something appears to be absorbing certain frequencies of the X-rays after they are emitted from the surface of the neutron star. 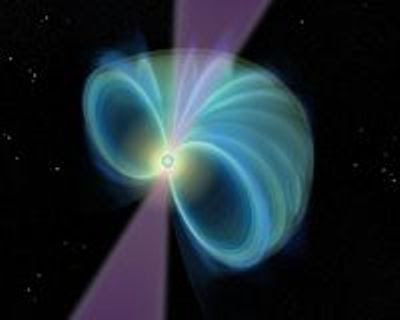 The absorption could either be happening in an atmosphere of gases surrounding the neutron star or by particles trapped in the neutron star's magnetic field. If the second reason is the cause of the absorption, it would indicate that the magnetic field of this RRAT is strong. "We can't say for sure where the absorption is coming from with these observations," says Nanda Rea, University of Amsterdam, Netherlands. She estimates that an observation twice as long would collect enough data to determine where the absorption is taking place. Since the original discovery of 11 RRATs, McLaughlin's team has found an additional 10. This indicates that they may form a substantial population in the Milky Way, with over 100,000 of them dotted around our galaxy.